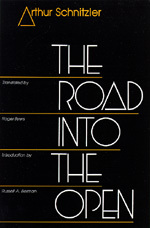 A finely drawn portrayal of the disintegration of Austrian liberal society under the impact of nationalism and anti-semitism, The Road into the Open (Der Weg ins Freie, 1908) is a remarkable novel by a major Austrian writer of the early twentieth century. Set in fin-de-siècle Austria—the cafés, salons, and musical concerts frequented by the Viennese elite—Schnitzler's perceptive exploration of the creative process and the private lives and public aspirations of urban Jewish intellectuals ranks with the highest achievements of Karl Kraus and Robert Musil. The novel's central character, Baron Georg von Wergenthin, is a handsome young composer whose troubled relations with women, musical collaborators, and representatives of the old social order make Schnitzler's book a revealing investigation of individual psychology and social allegory. In his comprehensive introduction, Russell Berman situates the book within the literary and political history of Central Europe and analyzes its relation to psychoanalysis, Marxism, musical aesthetics, and the legacy of European modernism. Arthur Schnitzler (1862-1931), an Austrian physician, wrote novels, short stories, and plays, one of which, La Ronde, was the basis of a successful film. Roger Byers is an independent scholar and translator in Bradenton, Florida. Russell A. Berman is Professor of German and Comparative Literature at Stanford University.